So, he finally mustered up the courage to pop the big question and of course, you said yes. Congratulations! You are about to embark on the biggest, most important journey of your life and it all starts now. Planning a wedding is exciting but it is also extremely time consuming, as well as exhausting. From centerpieces to the playlist for the reception, every little detail matters when it comes to planning your big day. However, one of the most important parts of planning your wedding, next to finding the perfect dress, is selecting the right person to do your wedding cake. After all, wedding cakes are a notable focal point of every wedding. At A La Carte Catering & Cakes, not only do we specialize in wedding catering and events, but we also specialize in designing and handcrafting extravagant wedding cakes. No matter the design, flavor, or style, there is no project we can’t handle. 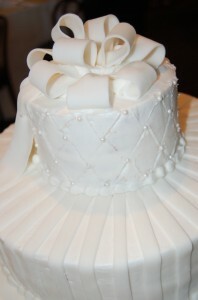 Each and every cake is carefully handcrafted for your special day. Baked from scratch and complete with intricate designs and details, our chefs will do what they can to fulfill your most lavish wedding cake dreams. While other catering companies are limited in what they offer, A La Carte Catering & Cakes offers the most comprehensive catering services, as well as elegant wedding cakes to brides and grooms in the DFW area. Your wedding day is one of the most important and special days of your life. You need to work with a company that doesn’t just recognize that but that also does what they can to make your day even more impactful and unforgettable. At A La Carte, we are dedicated to each every couple and to helping them make their dream wedding a reality. Your wedding marks the beginning of your new life together as couple. Start it off right with an A La Carte delicacy.